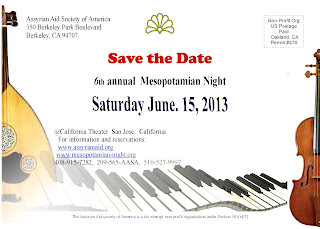 It's a great pleasure to announce that the talented singer/songwriter Stella Rezgo is going to be one of the singers to perform the songs of the legendary Assyrian singer Shamiram Urshan at the 6th annual Mesopotamian Night concert on June 15, 2013 in San Jose, CA. Stella is a talented singer who is truly memorable and naturally versatile with a deep emotional maturity. One-of-a-kind mix of Middle Eastern and contemporary. Stella Rezgo was born in Tbilisi, Georgia, while she was still an infant her family had relocated to Moscow, Russia where she was raised. She began performing and writing her own songs at a young age, never forgetting her Assyrian roots she had made a career as a female lead singer touring Europe with a band of talented musicians and an Assyrian dance ensemble called ‘Shamiram’ in 1994. Inspired by the tour’s success she eagerly continued to work on her first album and simultaneously worked as a host at the Assyrian radio station "Kalah Atyraya" in Moscow from 1994-1996 in a team with a great educator Marona Arsanis. Stella immigrated to Canada in 1996 and soon released her second album Wardah D’ Omta. Her music was also heard in the United States where it touched the heart of the Assyrian Community. Feeling blessed with the gift God has given to her, she feels compelled to give back to her community. She often assists the local Assyrian community with their many music projects. 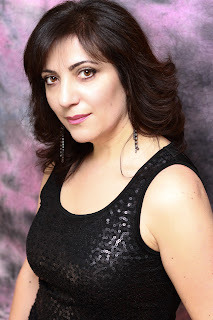 Stella can be heard as the lead vocalist, she can also be heard doing backup vocals which enhance and compliment the beautiful Assyrian song recordings of some of our well known singers. 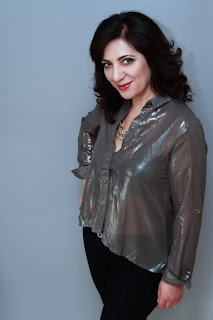 Stella has released 3 albums in the Assyrian language, her long awaited third album New Day (Youma Khata) has been released in 2010 as a result of a 2 year work including composing the songs and being involved in every step of this musically creative process. The New Day (Youma Khata) album marked Stella’s come back after 12 year break she took to raise a family. Currently Stella is performing and working on her new songs with other Assyrian artists, songwriters and lyricists. Her latest video “Melaty” is a result of collaboration with a talented Assyrian poet Ninib Toma. Stella is able to write songs and sing in the Assyrian, Russian and English languages, being a Gemini this is no surprise because she, as most Gemini’s are, likes to multitask and is always eager to take on new challenges. Mr. Marcel Josephson has been a contributor and sponsor to Mesopotamian Night Project in the past several years. For the 2012 MN production, he has been instrumental in the translation, preparation of the text for the Malek Rama Lakhouma musical. For our 2013 production, he has taken an active role as a lyrics writer. His "New Mesopotamia" poem will be our feature presentation with a beautiful composition by Rev. Samuel Khangaldy. I had always wanted to write something for my beloved ancestral homeland; something for Atour, Nineveh, or Bet-Nahrain. Writing however, had not been my forte. Nonetheless, any poem or piece of music involving people’s celebration of their homeland had appealed to me in a very distinctive way and had inspired me greatly. As such was a piece of music I had come across with entitled “Yerevan-Erebuni” composed by Edgar Hohanessian (1930-1998) and performed by the National Chamber Orchestra of Armenia. From time to time, I still listen to this inspiring and uplifting music. Its lyrics very eloquently illustrate the perpetuation of ancient Armenian heritage through the history up until present time. The lyrics also promote a genuine affection of a people collectively toward their capital city (symbolizing their sovereignty). Having been fascinated by this work (music and lyrics), I started writing my poem, the “New Mesopotamia”. I wrote it in five syllables per line measure to meet the requirements for performance using the music of “Yerevan-Erebuni”. I even went as far as trying to make contacts in Armenia to get music scores for “Yerevan-Erebuni” as well as permission to have it performed with my lyrics. Later on I realized that my poem could also have been performed using music of the “Vacant Nineveh” by the late Rabi Paulus Khofri (1923-2000) with an inconsequential vocal adjustment. The lyrics of the “Vacant Nineveh” are in 11+10=21 syllables per verse measure. Each verse of the “Vacant Nineveh” would have accounted for four lines of the “New Mesopotamia” with respect to the count of syllables. As for the content, in the absence of an ideology or a strong leadership (each of which often is the driving force for liberating occupied lands or establishing new homelands for that matter) within our global community, I decided to plead my case before individual elements of Assyrian community. So, my poem addresses sons and daughters of Assyria individually. I do recognize that my poem is an ambitious dream. It portrays only my personal contemplations. This is what I had wanted to write for my beloved ancestral homeland. The initial version of the poem consisted of five eight-line verses and a four-line chorus that would have been sung once after each verse. The volunteerism was superb. I have not seen such a drive, determination, and inspiration in any of our events on the part of performers. This is only because of your leadership. You have demonstrated that you can work with a wide range of personalities. People from all walks of the life put numerous hours of work to set a new standard of performance. By moving to San Jose, you have brought with you reconciliation to a city that was torn apart by our churches. Seeing the hardliners of churches who quarreled a few years back all attending last night's event, was extremely joyful. Thank you again for your vision and your bonding demeanor that brings together people who would not be next to one another otherwise." As a result, shortly after, I sent Tony Khoshaba the first version of my poem and suggested that it would be considered for performance with the music I initially intended in the next Mesopotamian Night. Tony seemed to have liked the idea. I owe it to my wife who encouraged me to reconsider the music that was not originally composed for my poem and instead to discover whether Qasha Shmuel Khangaldy would be willing to compose a new music for the poem. I communicated with Tony that I had changed my mind on the music and asked him if Qasha Shmuel can be requested to compose an appropriate music for this poem. All worked well, Qasha Shmuel graciously agreed and started composing a new music. He provided invaluable inputs on my poem. The final version of the poem consists of three 16-line verses and a 16-line chorus. I have known Qasha Shmuel’s musical works for a long time. His music is lively and keeps the listener engaged. The “New Mesopotamia” is no exception. Composing this poem has been a great experience for me. Furthermore, having been in a position to work with an extraordinary musical talent like Qasha Shmuel Khangaldy, I consider a privilege and a blessing. My sincere thanks and gratitude to Tony Khoshaba, this exceptionally noble and selfless son of our Assyrian community for leading this work to fruition. The legendary singer Shamiram Urshan (1938 - 2011) will be honored at the 6th Annual Mesopotamian Night concert on June 15, 2013 by presenting four of her songs for our audience. Two singers will perform Shamiram's most popular re-arranged songs along side the 50-piece "Mesopotamia Symphony Orchestra"
Shamiram was born in 1938 to Daniel and Salatin Georgie in Tehran, Iran as the youngest of four children. She began singing and acting at the age of eight in school plays at the "Forozesh School". She became more active in music, both singing and playing instruments. After the completion of high school, Shamiram enjoyed teaching dancing to kindergarten children and she was asked to perform at the Indian Embassy in Tehran. Shamiram demonstrated multiple talents in the performing arts. Her musical interests included music in Assyrian, Persian, Turkish, Arabic and Hindi. At the age of 22, Shamiram married and moved to the United States with her American husband and settled in Seattle, Washington. She raised three wonderful children and conveyed to them her cultural identity. During 34 years of living in Seattle, she remained very active in her community. Teaching Ethnic dance to children and performing at social events. In 1974, she performed in an Iranian Exhibition at the Worlds Fair. Shamiram decided to become a professional singer, once her children were well into school. 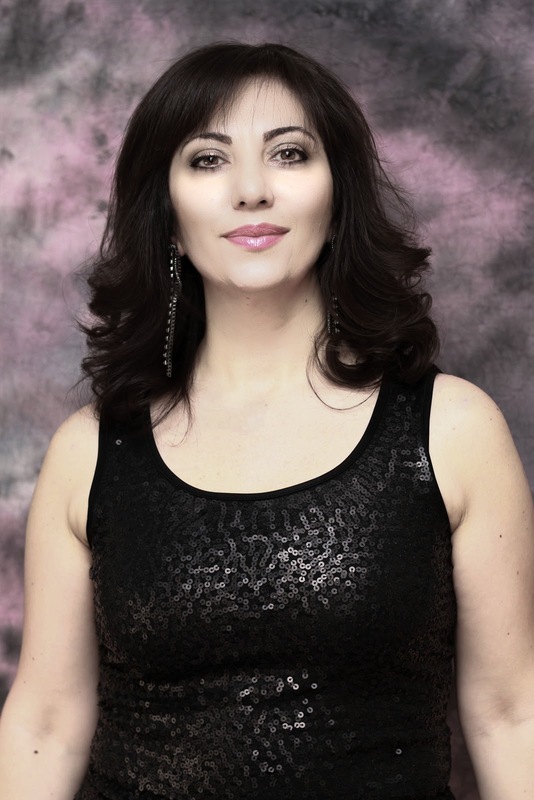 Having already Assyrian songs composed by her late father Daniel Gevargis Urshan, she recorded her first album in 1978, titled Shamiram after the Assyrian legendary queen Semiramis. The album was very well received internationally which led to singing engagements around the world including Europe, North America and Australia. Her style was heavily influenced by Greek music. She released three more albums during the 1980s “Dreams,” (1982) “Ashikoota” (1984), and “Feelings” (1987). A compilation album was later released in 1995. Shamiram moved to Los Angeles, California with her husband during her later years to be closer to her grandchildren. She had almost disappeared from the music scene until June 25, 2011, that’s when the Assyrian nation had learned about the passing of its legendary singer or as they loved to call her “yimma d’zamaryateh” (mother of female singers). She is survived by her two sons, Daniel and Shah Pick (and their families), both servicemen in the United States Army, and one daughter, Samira, her husband Zaia, and her grandson Zaia. Her funeral was held at Mar Yousip Assyrian Church of the East in San Jose, California on July 2, 2011. Mesopotamian Night 2013 will have a special presentation of late Rabi Yacoub Bet Yacoub old songs thank to a generous contribution by the Jacob family and in particular Mr. Ted Jacob. 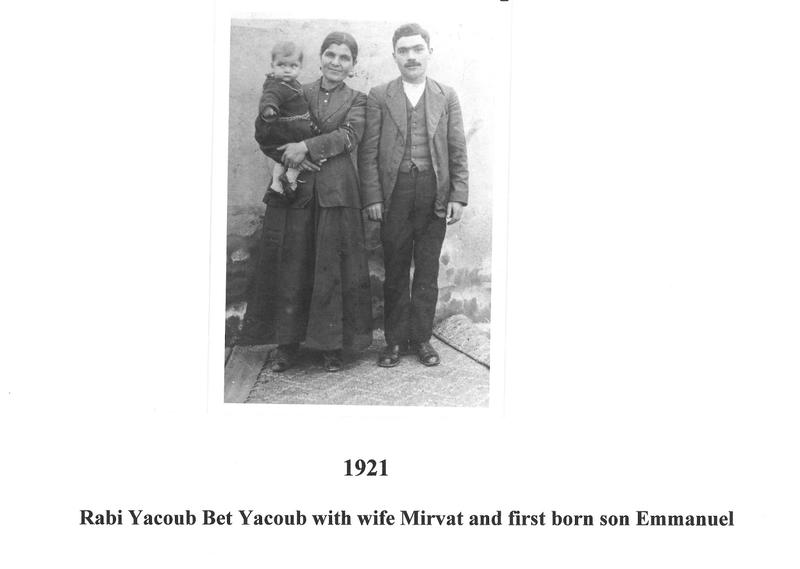 Below is a short biography by Mrs. Samira (Shamiram) Hermes, his daugher. Rabi Yacoub was born on December 25, 1896, in the village of Goolpatalikhan, Urmia, Iran, to Yacoub and Marganita. He was named after his father who had passed away only a few months before his birth. He and his older sister Shooshan were raised by their mother Marganita and maternal grandfather Zaia (known as chokha Zaia). 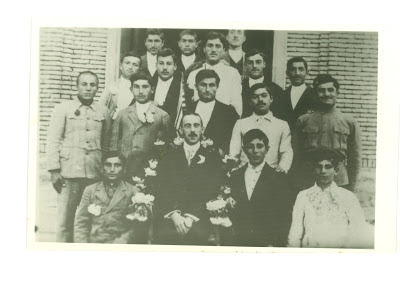 In 1917 he graduated from the American Mission College, which was known to the Assyrians as “Madrashta the’ Qalla”, taking general subjects. Amongst his teachers at the college were Rabi Pera Amrikhas of Ada, Rabi Isaac Urshan, and Qasha Isaac Malik. And for advanced studies, he was sent to Sardari College. Due to War turmoils, the American Mission College was closed in April 1918. That year Rabi Yacoub enlisted in the Assyrian Army in the Artillery division under the command of Agha Petros and Agha Mirza. He was involved in the battle of Ushnuk Saboulack. In Apshina (Hamadan) he re-enlisted in the army for a period of three months. The British and Agha Petros were enlisting men for the purpose of returning and taking Urmia. Later the British changed their mind and the enlistees were disbanded. The Assyrian exodus from Hamadan to Kirmanshah and eventually Baquba (Iraq) took 35 days. During this period Rabi Yacoub was sick. After his recuperation, he was requested by a Mr. McDonald to teach in Camp No. 1 in Baquba. 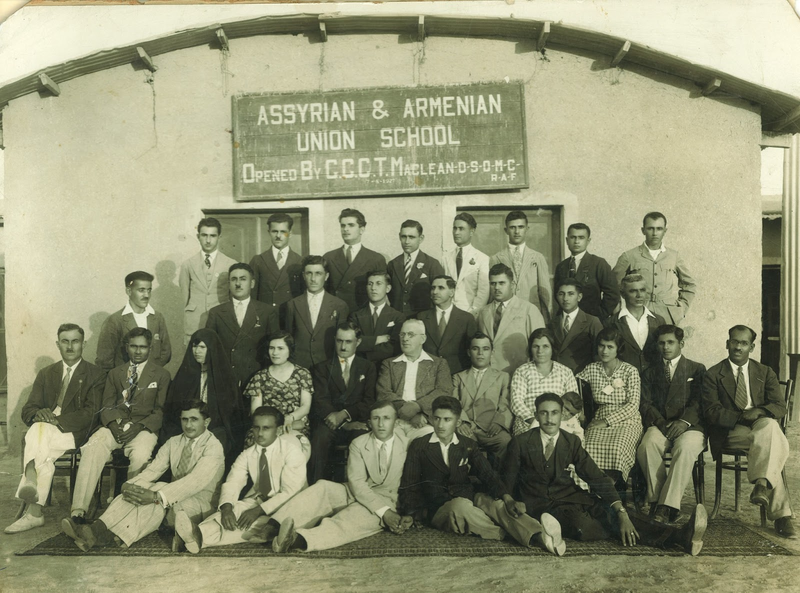 About 150 students, mainly, “Assyrians “ attended school for a period of two years. While in Baquba, he met an Armenian widow Nevart Khachatorian “known as Mervat”. They were married by Qasha Keena. He adopted her two daughters Arpineh and Kenarik. 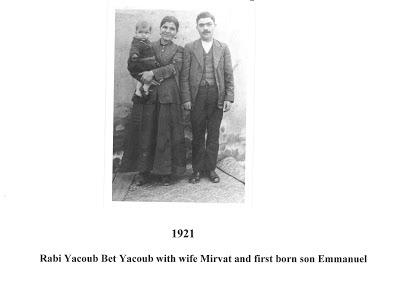 In 1920, the Assyrians were sent to Mandan (Iraq) and the Armenians to Basrah (Iraq). Meanwhile his son Emmanuel was born. Rabi requested that he and his family be sent to Basrah, hoping that from there they would go to the United States of America. This did not happen. Because of his slight military experience, he was asked by a British commander, whom he had met in Baquba, to train a platoon to guard the Armenian camps. Later he worked as a Tally Clerk for the Port of Basrah. In 1922 he resigned this post and moved the family to Baghdad where he was involved in a business for two years. 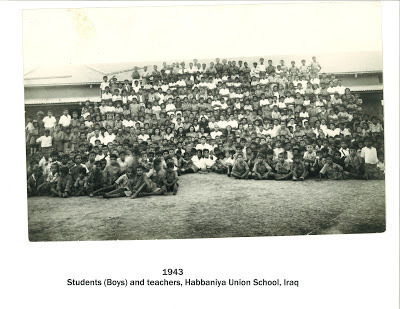 In 1924 Rabi Yacoub was called to attend a meeting of Assyrians and Armenians in Henaidi under the sponsorship of Mr. Ingram who was the camp superintendent. In the meeting Rabi Yacoub was offered the position of School Principal. He was School Principal in Henaidi from 1924 to 1938. During this time period his son William and daughter Shamiram were born. 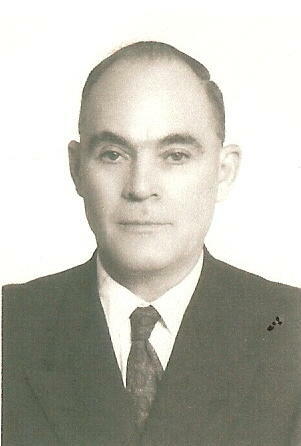 He continued serving as school principal in Habbaniya from 1938 to 1944. During these years, he was instrumental in educating several thousands of Assyrian and Armenian Students. Along with his busy life he found support from his wife ”Khata” Mervat who was active in the community by teaching embroidery and needlework to the ladies in Habbaniya. She also hosted meetings of school staff at home. She was a sweet, quiet, loving and respectful lady. Rabi Yacoub was an Assyrian scholar-educator, prolific writer-poet. He has translated several Shakespearean and other plays in Assyrian and had these played on stage by students. Rabi has also written extensively on different subjects. Unfortunately most of his work was borrowed by different groups and were never retrieved. Some of his work remains unpublished. 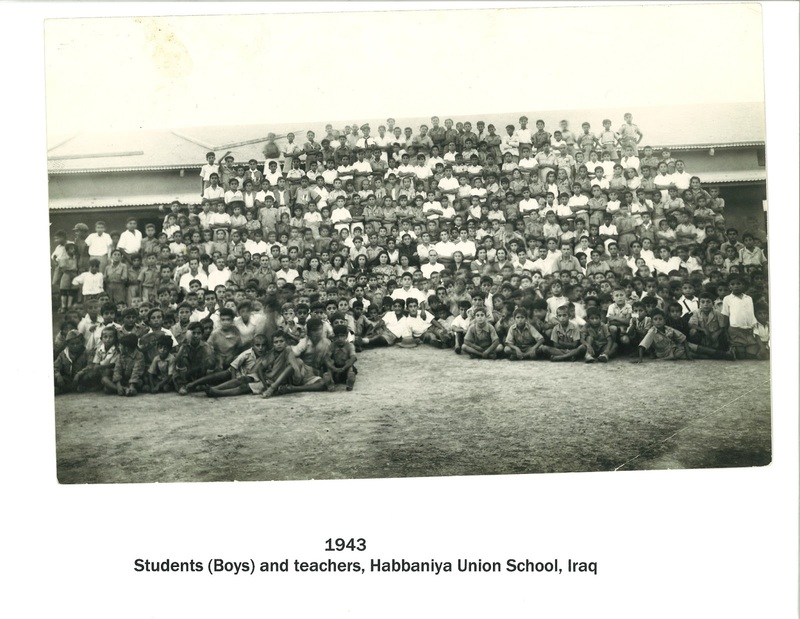 In 1944 after the school in Habbaniya was nationalized he moved his family to Baghdad. He worked as a business man for many years. In 1965 he lost his wife Mervat . 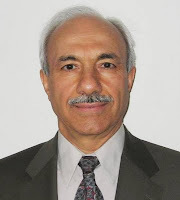 Rabi Yacoub immigrated to the United States in early 1972 and settled with his son Emmanuel and his family in El Cerrito, CA then moved to Santa Ana, CA. lived with his son William and his family for many years. As his health deteriorated he lived with his daughter Shamiram and his Son-in-law Sargon Hermes in Daly City, CA where he passed away on December 25, 1988 at the age of 92. The surviving members of his family are: his daughter Shamiram Hermes and her family; late Emmanuel’s children Ted Jacob and Peggie Hernandez; late Willams’ children Dina Powers, Adena, Paul and Peter Jacob; in addition grand and great-grand children, nephews and niece. Rabi Yacoub taught for a total of 25 years and had produced a generation of well educated youth who served their nation and families efficiently. He touched the lives of thousands of students whom he disciplined educationally and morally. He instilled in their minds a sense of responsibility. He trained and inspired confidence in them-selves. He will be remembered as a hero who served his nation in a self denial way. Rabi Yacoub was one of a kind. He was a prominent educator. He lived full family life. He was a truly fine person and a religious man; yes, a gracious human being. This was Rabi Yacoub Bet Yacoub. 1. 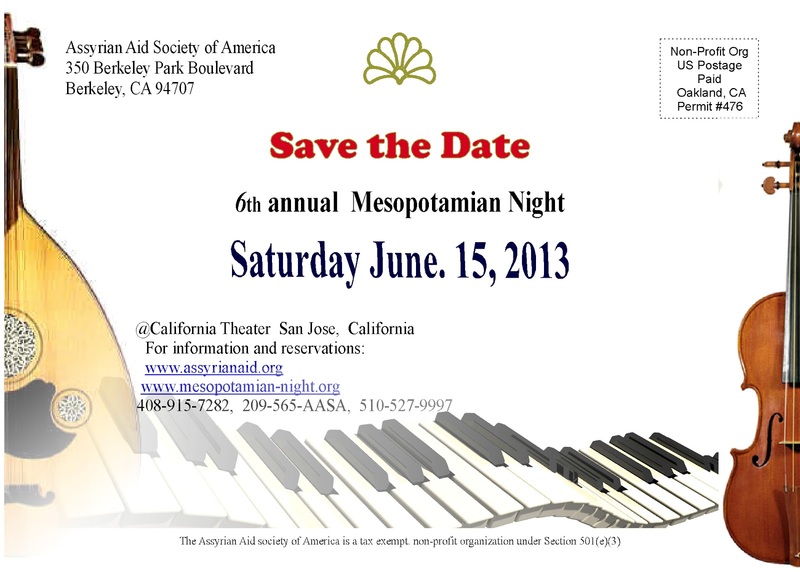 Mesopotamian Night 2013 is set for June 15th, 2013 at the California Theatre in San Jose, California. 2. The program content are being developed. 3. Obeit Yadgar has returned as the writer for the project after his absense in 2012 project. 4. John Bailey Kendal will continue to serve as conductor for the Mesopotamia Symphony Orchestra. 5. The old songs of late Rabi Yacoub Bet Yacoub will be one segment of MN2013 presentation. 6. The songs of the late Shamiram Urshan will be another segment of our presentation. The Assyrian singer Stella Rezgo http://www.stellarezgo.com/ will sing Shamiram songs. 7. 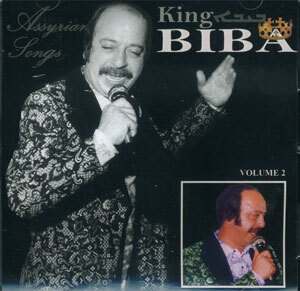 The songs of late Edward Yousif (Biba) is the third segment of our presentation Assyrian songs. 8. At least two songs from Rabi Nebu Issabey will be presented by a large choir group. The magnificent Oratorio of "Mar Benyamin" is the feature presentation of the choir group. Re. Samuel Khangaldy has orchestrated and arranged this oratorio. 9. The musical commedy "The Marriage Proposal" of Rabi William Daniel is our other feature presentation. This work again is being orchestrated and arranged by Rev. Samuel Khangaldy. More information will be provided as we make more progress. It has been a while we have not updated this blog page and we appologize for this. While the blog pages provide valuable information, lately we mostly relied on facebook social network to update our audience about Mesopotamian Night. But this is going to change as we are attracting more volunteers to help with our project. Stay tunned as we update this blog page more frequently.